"Thanks. The Angel arrived midweek and is everything was expected. 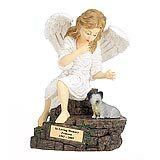 Your product is quite beautiful and a wonderful memorial to a loved pet." 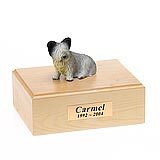 All available Skye Terrier dog urns and memorials will be displayed with the figurine on the Skye Terrier urn you select and in the appropriate size.